Hello and welcome to the 551st installment of the SWD. Hayat Tahrir al-Sham returned Deir Balut checkpoint in Afrin region to Faylaq al-Sham, after the former seized it last night. Besides the checkpoint, Hayat Tahrir al-Sham also handed over three elements who conducted the attack. The elements will be tried in Faylaq al-Sham’s courts. Al-Jaysh al-Watani al-Suri’s (Syrian National Army) spokesman, Mohammad al-Hamadin released a statement announcing his resignation from the position due to “special circumstances”. Last night, Syrian Arab Army’s S-200 surface-to-air missile system downed a Russian Air Force’s Ilyushin Il-20 aircraft during the yesterday’s targeting, which was conducted by the Israeli Air Force. According to the reports, at least 14 Russian military personnel were killed in the incident. Russian Ministry of Defense stated that it holds Israel accountable for the incident, as one of its warplanes allegedly used the Il-20 aircraft as cover. The special missions groups at the authorities concerned killed two of Daesh (ISIS) terrorists and arrested 7 others, in addition to confiscating an amount of narcotics, a telecommunication station, automatic rifles, a machinegun and US-made ammunition in a double ambush in Palmyra countryside, Homs. Authorities told SANA reporter in Homs that based on intelligence information and after a precise tracking of the axes from where terrorists infiltrate, a group of the special missions carried out an ambush 30 km to the west of Palmyra city in the area of al-Abtar Mountain targeting a terrorist group affiliated to Daesh whose members were on board a motorcycle coming from al-Tanf area towards al-Bayarat al-Gharbyia in Palmyra heading for Raqqa. The source added that members of the special missions groups clashed with terrorists and managed to kill two of them and to confiscate their weapons and six motorcycles while the remnants of the terrorist group fled away. The source said that special missions group carried out another ambush in the area of al-Frou’a, 70 km to the southeast of Palmyra city as five terrorists were arrested, in addition to confiscating 10 motorcycles, 146 pieces of hashish and 14 bags of Captagon containing 10 thousand pills. According to the source, the operations also resulted in seizing two Pickup cars, the first of which equipped with a telecommunication station, while the second is equipped with a US-made machinegun, in addition to US-made M16 automatic rifles and six boxes of ammunition. Our forces continue their military operations against maercenaries as part of the battle of defeat terrorism campaign, which is the completion of the “Island Storm” campaign, making further progress in all areas where violent clashes are taking place. 1- Hajin axis: Our forces clashed with mercenaries at several points and achieved progress at a distance of about 2 / km. Our forces managed to establish 15 points. The mercenaries attempted to sneak into surprise attacks, but our fighters fought back, killing a number of them and injuring others, while the others fled. One of the fighters was killed in the clashes, while another was wounded. The region is now witnessing a cautious lull. 2 – Kasra axis: one of our fighters was wounded; as a result of being targeted by a mercenary sniper, and the situation is currently stable. A mine exploded with five of our fighters, injuring the five, two of them critically, and the other three were in stable condition. The International Alliance aircraft also carried out several air strikes against the concentration of mercenaries, and the extent of the losses that have been inflicted on them has yet to be ascertained. One mercenary was also killed. Al-Shaddadi axis: Strong clashes broke out between our fighters and mercenaries for half an hour. Our fighters used mortars to hit the positions of mercenaries. None of our fighters was hurt. 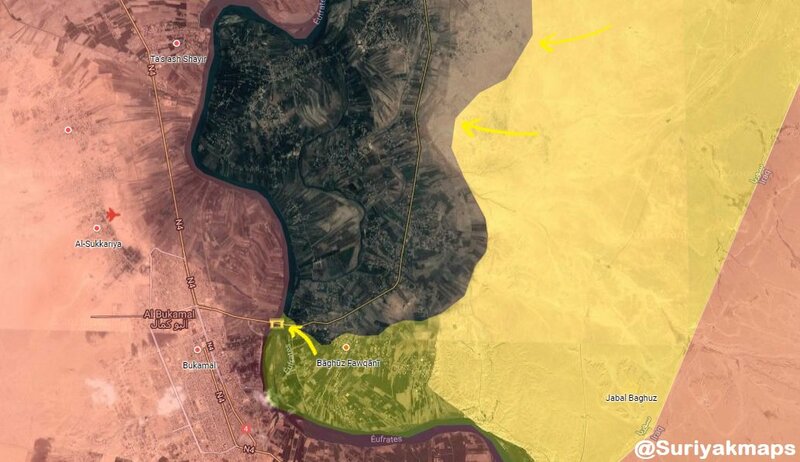 Following these clashes, our fighters achieved a distance of 1 km and were able to set up 17 new points on this axis. Coalition aircraft carried out several raids on mercenary sites and concentrations. 4 – Al-Bagouz axis: Violent clashes broke out between our fighters and mercenaries, in which mercenaries used thermal rockets, in which our troops returned to the source of fire, while our forces targeted during the clashes a mercenary sniper and killed him. In the clashes since late evening, our forces have made significant progress inside the town of Baguoz, where the mercenaries’ defensive fortifications have been destroyed. This axis also witnessed violent clashes yesterday night. The field command confirmed the killing of 17 mercenaries. They also arrested the mercenary (Ahmad Ahmed al-Sa’id, also known as Abu Hajar al-Shami). They also destroyed a military vehicle while the engineering teams dealt with 60 mines planted by mercenaries in the area. Our forces moved into the town of Al-Bagouz, amid violent clashes and strikes on the outskirts of the city. The bodies of mercenaries were scattered all over the town. The field command confirmed that the mercenaries were trapped in more than one point inside the town. Our forces succeeded in liberating and securing the bridge between the town of Al-Bagouz and the city of Bou Kamal, after violent clashes with mercenaries, which began from the evening until the early morning hours. The mercenaries launched an opposite attack this morning to recover the bridge, but our forces confronted them and killed them. Mercenaries. Our special units managed to free two Yazidis from Shankal abductees. 3 of our fighters were wounded, and another was promoted to the rank of martyrdom. 35 were killed during the clashes, while the International Air Force carried out 9 air strikes on mercenary sites. Points installed / 64 / points. Two of our fighters rose to the rank of martyrdom, and several of our fighters were wounded. Afghan National Security Forces killed five and wounded four elements of the Islamic Emirate of Afghanistan (Taliban) in Pashtun Kot and Kohistan districts. Islamic Emirate of Afghanistan’s Al-Emarah News stated that the group overran Koh Sayyad area of Shirin Tagab, after seizing two Afghan National Security Forces’ base and three checkpoints. Afghan National Security Forces killed 15 elements of the Islamic Emirate of Afghanistan in Qarqin district. 17 elements of the Afghan National Army defected to the Islamic Emirate of Afghanistan in Qarqin district. Afghan National Security Forces killed five elements of the Islamic Emirate of Afghanistan and destroyed a vehicle in Qalay-I-Zal district. Afghan National Security Forces reportedly killed 30 and wounded eight elements of the Islamic Emirate of Afghanistan, as well as destroyed several weapons depots and ammunition caches in Jalrez district, according to the Afghan Ministry of Defense. Afghan National Security Forces killed six and wounded two elements of the Islamic Emirate of Afghanistan in Ahmad Abad district. Afghan National Security Forces killed seven elements of the Haqqani Network and destroyed two vehicles in Nadir Shah Kot district. Afghan National Security Forces killed two and wounded one element of the Islamic Emirate of Afghanistan in Muqur district. Islamic Emirate of Afghanistan raided an Afghan National Army’s base in Deh Yak district, killing six soldiers in the process. Islamic Emirate of Afghanistan seized an Afghan Local Police’s post in Wor Mamay district, reportedly killing three elements of the police in the process. Afghan National Security Forces killed six and wounded nine elements of the Islamic Emirate of Afghanistan in Anar Dara district. Islamic Emirate of Afghanistan ambushed a group of Afghan National Police’s elements in Zartali area of Deh Rawud district. Three elements of the Afghan National Police were killed in the ambush, while the Islamic Emirate of Afghanistan seized an assault rifle and a motorcycle from the killed elements. Afghan National Security Forces killed one and wounded one element of the Islamic Emirate of Afghanistan in Nad Ali district. Afghan National Security Forces killed six and wounded five elements of the Islamic Emirate of Afghanistan, as well as destroyed two motorcycles in Shah Wali Kot district.